We are offering Heavy Duty Recoiler to our clients. We have uniquely positioned in the market by offering Recoiler For Bimetal Strips at very cost effective rates. 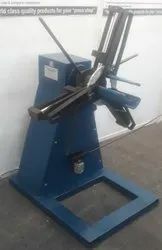 We are offering a wide range of Recoiler. These Recoiler are fabricated using high grade raw material and are known for high performance, efficiency, ease of use and durability. Available in standard specifications. Our Recoiler is highly acclaimed for its features of smooth operations, optimum performance, low maintenance and long service life. We are a trustworthy company of the industry, effectively engaged in Manufacturing and Supplying supreme quality Recoiler for our esteemed customers. The products offered by us have a highly distinguished place in the market, and available to the customers at attractive market prices. 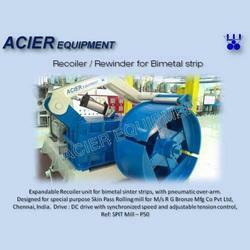 Catering to the demands of customers as a reliable organization, we are engaged in providing Recoiler Mandrel. Recoiling line is highly automated and designed to trim material in needed width and to segregate defective material from prime quality material. Recoiling line is equipped with oiler for post treatment. In recoiler guiding system, the strip is not corrected by the position error & rather the recoiler is continuously aligned to the position of the strip.